Community colleges are, traditionally, locally-minded places (hey, it’s right there in the name). But two-year campuses have as much to gain from cultivating a diverse and global student body as any other educational institution—and international students have much to gain from considering this non-traditional avenue to an American diploma. Our Enrollment management friends at 4-year institutions have long looked to community colleges as a valuable pathway for recruiting international students already studying here in the US. With roughly 95,000 international students studying at US community colleges (thanks for tracking this IIE), this makes a nice pipeline for 4-year institutions seeking students who have already succeeded at acquiring a US visa. Another recruitment channel where international students already have acquired a US visa: US private high schools with more than 80,000 international students. We'll be talking to the private high school community at the TABS Global Symposium on April 30 in Newport, RI. Join us there and build important relationships to become more effective with this valuable recruitment pipeline. Do you work at a 2-year institution? Are you at a 4-year institution interested in a quality recruitment stream? This topic matters to all of us. Keep reading. With the continued budgetary pinch the academic community is facing, community colleges have been turning to international student recruitment over the years. Yet they face hurdles that others institutions do not. There is a significant bias that Chinese and other international parents have against 2-year colleges. International recruiting agents find the commissions lower (based on common rates of about 15% of first year tuition) and so, turn to more traditional 4-year institutions. Don't even get us started on the US State Department's visa issuance hurdles that students admitted to community colleges face. According to IIE, community colleges host 9% of international students in the U.S overall and they represent about 1.4% of total community college enrollments. Most hail from China (20% of international students at community colleges), Vietnam (10%), and South Korea (7%). That’s a lot of students—and there’s room for more. The vast majority, roughly 90%, are on F-visas. It is important to note that the latest IIE data (2017/2018) shows a 2% decline in international students enrolling in community colleges. The enrollment pressures are everywhere. Find more fun community college data from IIE here. And providing specific support to community colleges with a global mindset, check out the Center for Global Advancement of Community Colleges run by our colleague Zepur Solakian. We've presented our recommendations for 4-year institutions seeking to build a recruitment pipeline from US community colleges along side our colleague Andrew Chen with WholeRen Education at AIRC. You can find the presentation on our SlideShare account. What Type of Students Choose This Path? b) do not have the resources for a full 4 years at a more expensive institution. Community colleges are a cost-effective on-ramp to the U.S. university system. The funds saved during the first 2 years can then be applied to the higher tuition rates at the 4-year institution they transfer to. This is smart economics for domestic and international students alike. For 4-year institutions, community colleges can present a great international recruitment avenue. Students who have spent two years at a community college have been vetted and have had time to acclimate to the American educational system. Plus, you don’t need to travel abroad or work with agents to connect with them -- though there is some discussion in the recruitment industry about using agents, and paying commissions, if an agent helps an international student transfer from a US 2-year institution to a 4-year institution. Time to rethink those community college transfer fairs as a worthwhile recruitment stop. 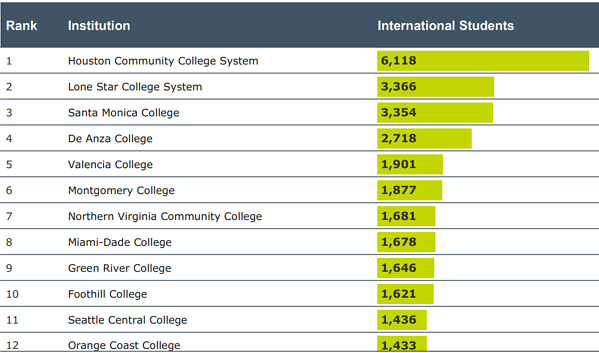 IIE tells us the community colleges with the highest international student enrollment numbers. Worth a look. Intead’s got you covered. 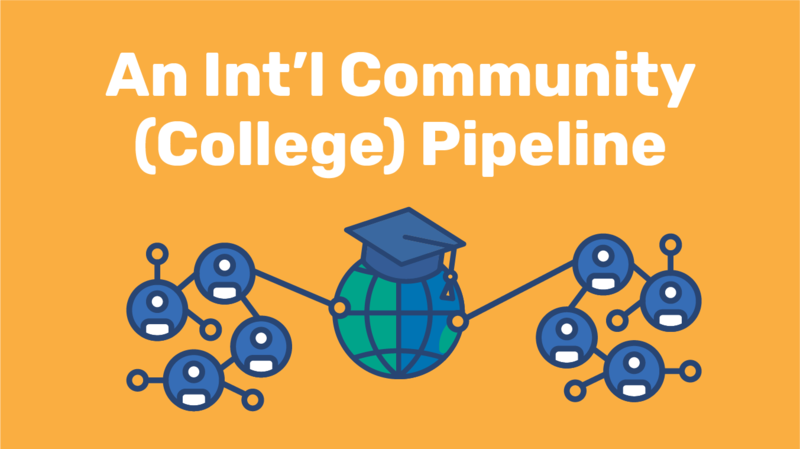 We’re here to consult about whether you should be making community college partnerships a bigger part of your international recruitment plan and how to work this channel into your larger student recruitment channel. Drop us a line: info@intead.com. Following our presentation at the TABS Global Symposium, we'll talk more about US private high schools as another valuable recruitment channel. Our Intead Plus members have access to the webinar we did with Michael Shaver from TABS last year. So much great data and planning advice right there.